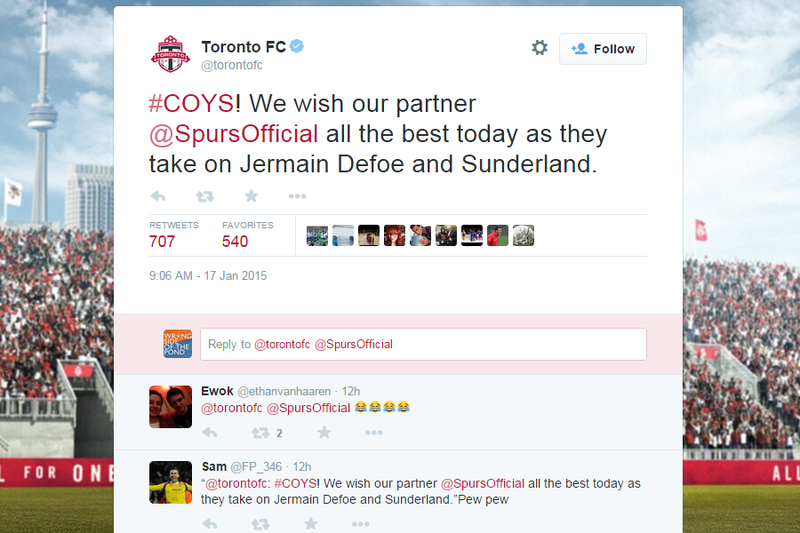 This is an actual screenshot of an actual tweet from the actual official Twitter account of Major League Soccer’s Toronto FC sent just one day after the club had shipped AWOL Englishman Jermain Defoe to Sunderland for cash plus Jozy Altidore. In fact, as of publication, this tweet is still somehow live. I totally get Toronto being pissed about the situation. Along with Michael Bradley, Defoe was to be the centerpiece of a TFC’s ascension to MLS royalty. They bent over backwards to land the former Spurs striker, including sky-high wages and reportedly appeasing his very demanding mother. Hell, they paraded him right out of the gates as a “Bloody Big Deal”. And even though they broke both the bank and the all rules about avoiding embarrassing English clichés, Defoe still left them high and dry just 11 months. But to take to Twitter and publicly root against a guy you had just called a “Bloody Big Deal” just one day later? Yikes. It’s hilarious, in that “you’re a crazy ex girlfriend” kind of way.